Wikipedia's article on Mount Pleasant Township, Wayne County, PA.
USA.com's demographics on Pleasant Mount, PA.
PA is #20 in FreedomInThe50States.org! Forest City News includes a "Pleasant Mount News" column. "Previous to the organization of this town, the settlement was usually called Stantonville. In regard to the origin of the name it now bears, it is obvious that no created being gave it. The Hand that formed these hills and clothed them with their beauty, wrote its name, Man has only read it here. It could be called nothing else. The men who struck the first blow in the wilderness found it here. It is said that one Robert L. Hooper, in surveying his lands here in 1775, while overlooking the township from one of the elevations of the Moosic Mountains, was charmed with its beauty, and exclaimed, "This is Mount Pleasant." On this point there never has been a question. Mr. Stanton saw that the Creator had named it, and, therefore, the impropriety of connecting his own name with it. And what stranger even that overlooks these hills and valleys in their verdure, but must also say this town could be called by no other name? 1st Treasurer of the United States of America. Monument was unveiled June 8 1904. Samuel Meredith was born in Philadelphia in 1741. Young Samuel followed his father into the wool trade business, but political concerns attracted him. 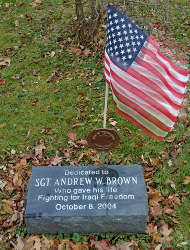 He fought in Gen. George Washington's army, rising through the ranks until, on April 5, 1777, he was commissioned Brigadier General of the Fourth Brigade. He must have earned favor with Washington because, on Friday, Sept. 11, 1789, Washington, then president of the United States, nominated Gen. Meredith treasurer of the United States, the first under the new nation's constitution. Samuel Meredith served in his post for 12 years under Presidents Washington, Adams, and Jefferson until poor health and neglected personal affairs led him to retire. About 1796, Gen. Meredith purchased a strip of land in Clinton, Mount Pleasant and Preston townships, Wayne County, some 20 miles longs and 2 miles wide - nearly 26,000 acres. About 1800, he built a home at a cost of $6,000. He called the estate Belmont. In 1801, Meredith retired to Belmont and spent the last sixteen years of his life there. 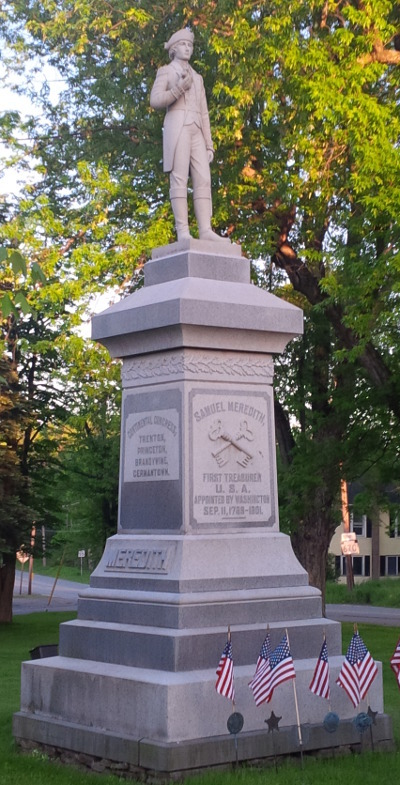 General Samuel Meredith died on Monday, Feb. 10, 1817, at 76. His wife survived him nearly four years, dying Sept. 20, 1820. They were both buried in the private burial-ground of the family, on the estate in northern Mount Pleasant township. 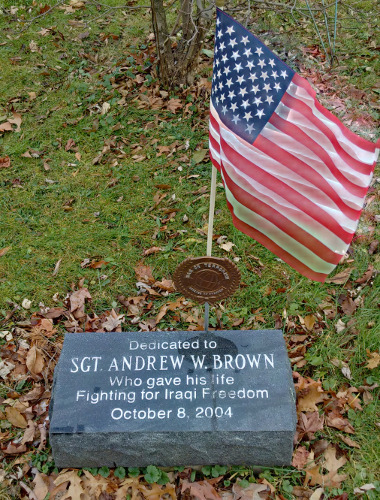 sacrifice of our very own Sgt. 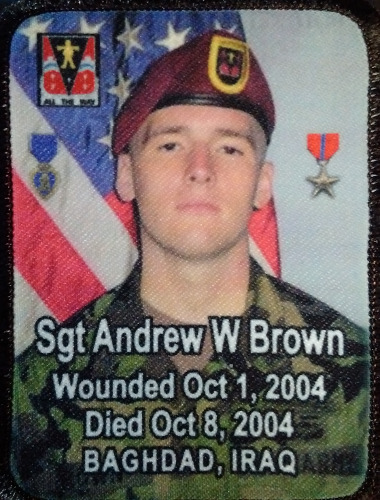 Andrew W. Brown. 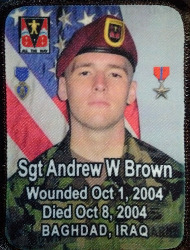 Wounded in Baghdad, Iraq, died Oct. 8 2004. Click either image to see a larger photo in a separate window. American Legion Post 964 "Costello-Monahan-Brown, Inc."
"The Golden Age of Pleasant Mount," from 1791 to 1796, while 82 miles from Easton, the seat of justice; there was no law put in force but the law of forbearance, having no law, the people were a law unto themselves." The land comprising Mount Pleasant Township was bought of the "Six Nations" in their "General Council" at Fort Stanwix, now Rome, N.Y., on the 5th of November, 1768, by the heirs of Wm. Penn. A lot of this land, comprising 322 acres was sold to a Mr. Christopher Hager in 1774. It passed through several hands when in June, 1789, it was purchased by Mr. Samuel Stanton, who became the first actual settler. Previous to the organization of Pleasant Mount, the settlement was usually called 'Stantonville'. In 1812, the township was called 'Beech Woods' and was a that time an almost unbroken wilderness. Many people become confused in the names Mount Pleasant and Pleasant Mount. The name of the township is Mount Pleasant and that of the village is Pleasant Mount. There is no evidence that Mount Pleasant Township was the home of any Indian tribe. No trace of battleground or permanent village was ever found, but there were indications that it was once occupied by them as a hunting ground. The village of Pleasant Mount, situated high in the Moosic Mountains, was first settled by Samuel Stanton on June 29, 1789. It was first called Stantonville, and later called Centerville. It was incorporated as a borough on March 27, 1845 under the name of Pleasant Mount. The first child was a daughter born to Mr. & Mrs. Samuel Stanton on August 26, 1791. The first male child was Jabez Stearns, born June 18, 1793. The first wedding was that of Silas Kellogg to a daughter of Jirah Mumford on January 1, 1796. The first death was Jacob Van Meter in the Fall of 1796. The first frame house was built by Mr. Joseph Tanner in 1795 on land now owned by George Moase. The first frame barn was built by Mr. Silas Kellogg in 1794 on land formerly owned by Howard Wildenstein. Granger and Tanner opened the first store in the village in 1806. Mr. Joseph Tanner was the first Justice of the Peace and Benjamin Dix was the first Constable. Mr. Joseph Tanner and Elijah Dix were the first road supervisors. 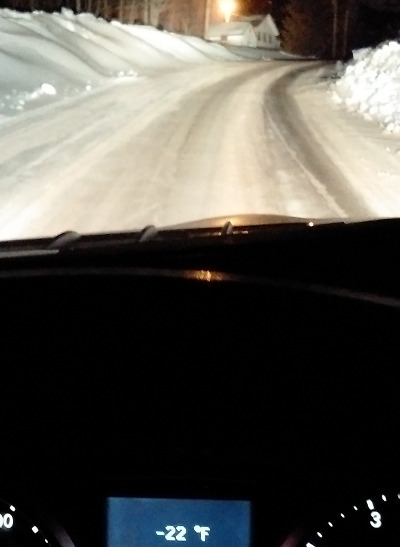 In 1788-89, the first road was cut thru the Township and was called the North and South road. The main source of income in the Township in the early days was timbering, buttermaking, grain growing, etc. In 1850, this Township produced 35 tons of butter, 12,100 bushels of oats, 5,400 bushels of Indian corn, and 6,831 bushels of buckwheat. There were 10 sawmills, 3 grist mills, 3 turning mills which used 225,000 feet of lumber. Also, there were 2 wagon shops, 5 blacksmith shops, 2 tanneries, and 1 carding and cloth making machine. There were 5 stores with an annual trade of $50,000. Religion was a major issue with our first settlers and in the Spring of 1793, regular public worship of God was commenced and has never ceased to the present day. The first resident clergyman, Epaphras Thompson, settled here in 1800. He as a Close Communion Baptist. The first Methodist clergyman was Rev. Annon Owen in 1806, and a Methodist church was built in 1832 on land now owned by Bert Kennedy. In 1814, a Congregational church was organized by Rev. Ebenezer Kingsbury, but it was changed to Presbyterian in 1831, and a church was erected in 1831. In 1835, there was a Roman Catholic church erected in the northeast part of the town. The first school held in a log house owned by Elijah Diz was taught by Miss Lucy Stearns in the Summer of 1794. She had 12 scholars and received 6 shillings a week. By 1834, there were 14 common schools with 500 scholars in the Township. Dr. Asa Parks was the first resident physician in the Township, settling here in 1807. One of the early settlers was George McMullen, who settled here in 1800. He as a great hunter and in one Autumn killed 65 deer, 11 bears, 6 red foxes, and 9 martens. One of the first graveyards was located on the land now owned by Dr. McAndrew and the first burial took place in June, 1802. The individual buried was a daughter of Mr. Abram Cramer. Our town is proud of Mrs. Sarah Benjamin who, with her husband, settled here in 1822. She fought in the Revolutionary War, and died at the age of 113. She is buried in the Methodist cemetery. In 1796, Mr. Samuel Meredith began to make improvements in this town. He built an ashery for making pot and pearlash, but this enterprise failed. He built a large residence at the cost of $6,000 and called it "Belmont". He was appointed the first treasurer of the United States by George Washington on September 11, 1789 and remained in office until Oct. 31, 1801. He resided in Pleasant Mount until his death February 10, 1817. Today, as we celebrate the Bi-Centennial, let us pause for a moment and give thanks to God for the brave men and women who came into the wilderness and carved out the roads and farms and settled in the town of Pleasant Mount. The Pleasant Mount Historical Society had much more excellent history and more regarding Pleasant Mount. Brett and Debra Kropf began their residence in Pleasant Mount (at 2,000 feet above sea level) in May 2014, on a former property of The Honorable John D. Brennan who purchased it from the Martin Prentiss Estate in 1909. Martin Prentiss acquired the four small parcels in 1856, 1869, and 1872 and appears to have included the house in the 1856 parcel from Dominick Loyd, and the house may predate 1856. 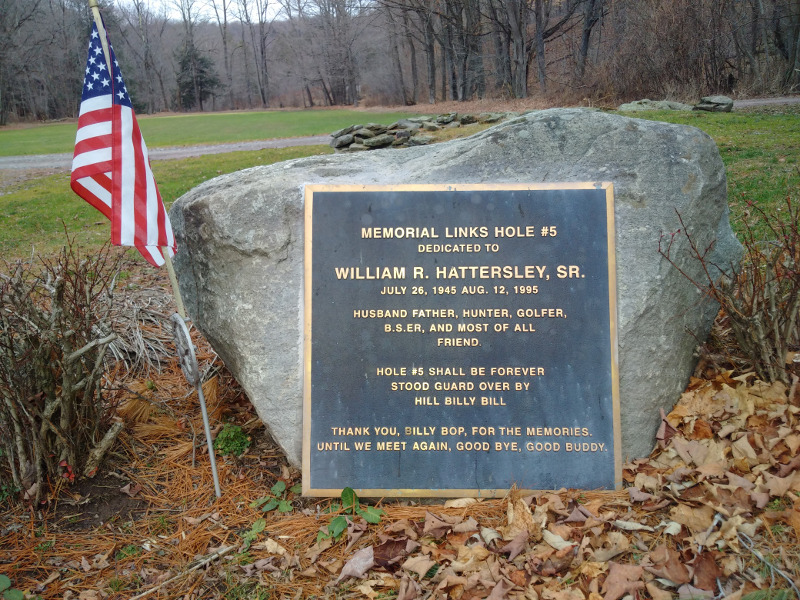 It is well known by most local residents as William and Elizabeth Hattersley's house, who owned it between 6/27/1972 and 9/18/2000 and raised a family here. 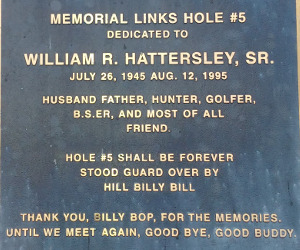 The memorial to William R. Hattersley, Sr. at Memorial Links Golf Course. Click the image to see a larger photo in a separate window. THANK YOU, BILLY BOP, FOR THE MEMORIES. UNTIL WE MEET AGAIN, GOOD BYE, GOOD BUDDY. Brett's Great-great-great Grandfather, George B. Wescott, was Prothonotary of Wayne County 1831-1836, died at about age 31, and is buried behind the Presbyterian Church in Bethany Cemetery. The son of Major Robert Wescott, George with his wife Caroline (Davenport) had a son born 1832 in Bethany, and named him Robert Wescott. Robert became a doctor, lived 57 years to 1890, and is buried in Lowell Cemetery, MA. If you have information regarding this Wescott family, please pass it along to Brett. It gets snow and cold in the Winters! or attach any metal or hard substance, into an electric utility pole". "Attaching signs, advertisements, flyers and other materials to utility poles can cause potentially serious safety problems." And "can present a serious and potentially deadly threat" to utility linemen." You may send an email to Brett. "It is doubtful if there is another county in the State of Pennsylvania which has so many townships and hamlets named for places in the Orient. Bethany, the second county seat of Wayne, is located on a hill, three miles north of Honesdale. Damascus, the largest township in Wayne, is withal one of the oldest. Galilee is located in said township and is also a beautiful village. There is Lebanon in northern Wayne, whose trees are as strong as those in olden times. The land of Canaan is also rich with milk and honey in Wayne county, while Salem is known as the "Land of Peace". Near Wayne's line are Lord's Valley, Egypt, and Promised Land."